Credit: Credit: pxhere.com; public domain. 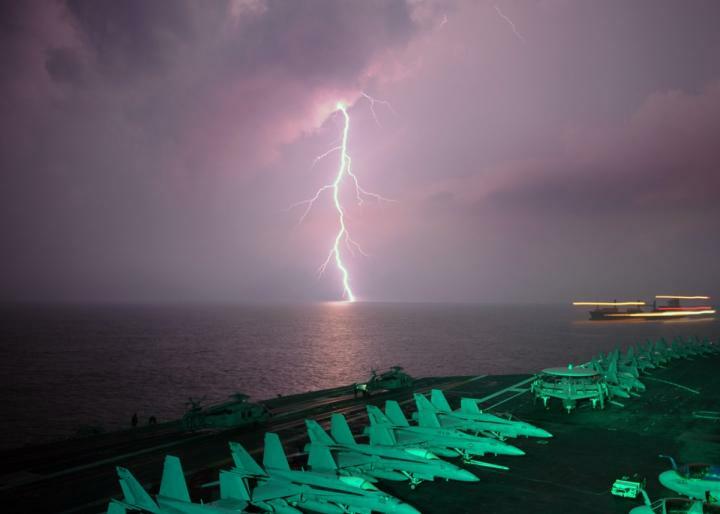 WASHINGTON D.C. — Thunderstorms directly above two of the world's busiest shipping lanes are significantly more powerful than storms in areas of the ocean where ships don't travel, according to new research. The new study is the first to show ship exhaust can alter thunderstorm intensity. The researchers conclude that particles from ship exhaust make cloud droplets smaller, lifting them higher in the atmosphere. This creates more ice particles and leads to more lightning. The results provide some of the first evidence that humans are changing cloud formation on a nearly continual basis, rather than after a specific incident like a wildfire, according to the authors. Cloud formation can affect rainfall patterns and alter climate by changing how much sunlight clouds reflect to space. "It is the first time we have, literally, a smoking gun, showing over pristine ocean areas that the lightning amount is more than doubling," said Daniel Rosenfeld, an atmospheric scientist at the Hebrew University of Jerusalem who was not connected to the study. "The study shows, highly unambiguously, the relationship between anthropogenic emissions – in this case, from diesel engines – on deep convective clouds." All combustion engines emit exhaust, which contains microscopic particles of soot and compounds of nitrogen and sulfur. These particles, known as aerosols, form the smog and haze typical of large cities. They also act as cloud condensation nuclei – the seeds on which clouds form. Water vapor condenses around aerosols in the atmosphere, creating droplets that make up clouds. Virts and her colleagues compared the lightning location data to maps of ships' exhaust plumes from a global database of ship emissions. Looking at the locations of 1.5 billion lightning strokes from 2005 to 2016, the team found nearly twice as many lightning strokes on average over major routes ships take across the northern Indian Ocean, through the Strait of Malacca and into the South China Sea, compared to adjacent areas of the ocean that have similar climates. More than $5 trillion of world trade passes through the South China Sea every year and nearly 100,000 ships pass through the Strait of Malacca alone. Lightning is a measure of storm intensity, and the researchers detected the uptick in lightning at least as far back as 2005. Water molecules need aerosols to condense into clouds. Where the atmosphere has few aerosol particles – over the ocean, for instance – water molecules have fewer particles to condense around, so cloud droplets are large. When more aerosols are added to the air, like from ship exhaust, water molecules have more particles to collect around. More cloud droplets form, but they are smaller. Being lighter, these smaller droplets travel higher into the atmosphere and more of them reach the freezing line, creating more ice, which creates more lightning. Storm clouds become electrified when ice particles collide with each other and with unfrozen droplets in the cloud. Lightning is the atmosphere's way of neutralizing that built-up electric charge. "We're emitting a lot of stuff into the atmosphere, including a lot of air pollution, particulate matter, and we don't know what it's doing to clouds," Sherwood said. "That's been a huge uncertainty for a long time. This study doesn't resolve that, but it gives us a foot in the door to be able to test our understanding in a way that will move us a step closer to resolving some of those bigger questions about what some of the general impacts are of our emissions on clouds."